Tri-County Water - No Water? Why don't I have any water? We expect water to come out of the faucet when it's turned on. It's not something most of us even think about, it just happens. But on those rare occasions when it doesn't, what do you do? Use this flowchart to determine what the problem might be. ---- Water quality is an issue with many symptoms, causes and solutions. It can be a bad taste or odor. It may be a discoloration in fixtures or in the water itself. Sometimes this is subjective and requires a fully equipped testing facility to make a determination of any problems. The water that we deliver to your house is treated for us by Project 7 Water Authority in Montrose. They also treat the same water for the cities of Montrose, Delta and Olathe as well as Menoken and Chipeta water companies. We are fortunate to have such high quality water in this area but on rare occasions problems will arise. Often times this will be air in the water caused by a line break or power failure at one of our pump stations. You’ve probably seen it before. A glass of water filled out of the tap will have a milky or bubbly appearance. This usually disperses pretty quickly. If you experience this, our crews can come out to your area and bleed out any remaining air in the main line. Just give us a call. Quality issues beyond that get harder to pin down. Project 7 releases an annual water quality report that is the result of extensive water quality sampling over the previous year. Back issues of these reports are available on our website. In addition to these tests, Tri-County service technicians sample the water at 45 sites throughout the service territory. Each month 15 sites are sampled on a rotating basis so that in any three month period all 45 sites are sampled. These water samples are sent in to Project 7 for analysis at their laboratory. These results are on file at our office for up to 7 years. Providing good clean drinking water is of the utmost importance to us and if you have any questions or concerns please feel free to contact us at 970 249-3369. ---- If your water pressure starts out high when you first turn on a faucet but then drops off to a much lower pressure or flow rate, you could have a bad pressure regulator. Regulators, like anything mechanical, will eventually fail. This regulator may belong to you and it may belong to Tri-County Water. If it belongs to Tri-County, it is in the meter pit. If the regulator belongs to you, it is most likely under your house or in a separate pit on your property. Customers are not permitted to install their regulator in the Tri-County pit. A site visit by a serviceman will determine if a regulator is present, if it has failed and who owns it. If it is Tri-County’s regulator the serviceman will install a temporary reg and you will be given a grace period to get your own reg installed. (see Sec 13 of the Operating Policy). If the regulator is yours, you will need to have a plumber replace it or do it yourself if you are comfortable taking on such a task. A failed regulator can either raise or lower your normal pressure depending on exactly how it failed so you could notice reduced flow out of a shower head or unexplained ‘popping off’ of a relief valve on your water heater. Call Tri-County during normal office hours at 249-3369 if you require any assistance in troubleshooting. ---- Water and cold weather don’t play very well together. If normal precautions are not taken, the waterline can freeze anywhere from the meter pit to the house. In general, our mainlines are buried deep enough that they will not freeze but that is not always the case with a customer service line. A shallow line and low or non-existent flows through the line can freeze in negative temperatures such as we often experience here. If there has been a snowfall prior to cold temperatures, the snow would act as an insulator but if the snow has been removed from the ground above the service line or the meter pit the it may freeze. If you know where the meter pit is, check to see if something has disturbed the snow cover. The meter pit is marked by a 2 x 6 wooden post with a metal tag on it so we can locate the pit without disturbing snow cover. If there has been an extended period of inactivity such as the occupant going out of down during cold weather, the meter itself could freeze. This may not exhibit itself until the weather warms up and then water starts running out of the pit. If water lines are exposed to the elements in areas such as open or exposed crawl spaces or if a garage door is left open in exceptionally cold weather, this could lead to a freeze-up in the service line and is certainly not going to be fun for the homeowner to remedy it. Running a slow stream of water out of a faucet during cold weather can help keep lines from freezing. If no water is flowing at your house, take a look around to see what may have happened and then call the Tri-County office if you need further help in diagnosing the problem. Remember that just because it’s cold doesn’t mean the main line didn’t break somewhere and is not related to the weather at all. If this is the case, our crews will work to restore service as soon as possible. 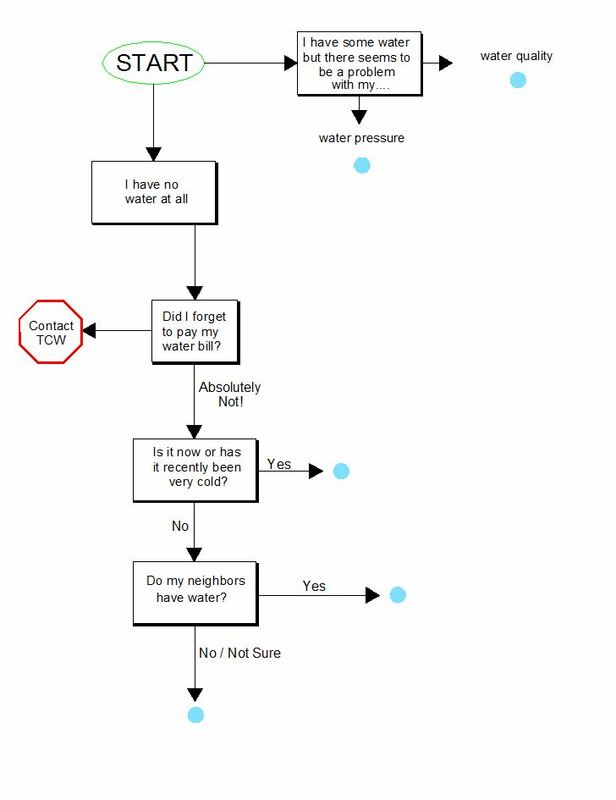 ---- If your neighbors have water and you don’t, the most likely cause is a problem on your property. The first place to check is in the service line to your house from the meter pit. Keep in mind that the problem could also be in the meter pit itself or a problem with the tap on the main line. Before calling Tri-County, take a look around your property for any obvious problems such as pools of water where none should be. If you know where your service line is, look along the route that it takes from the meter pit to the house. The majority of residential meter pits are in front of the property along the main road that fronts the property. It should have a 2 x 6 post marking its location. Please be aware that TCW does not know where your service line is and will not locate or repair it. That is the responsibility of the home/property owner. We can turn the service on and off for you while repairs are made. There are private locating services available and we can give you a list of ones operating in your area. ---- If neither you or your neighbors have water, that’s probably good news for you, considering the alternatives. If the water is off to an area or group of meters, it is likely a problem that we are already aware of but please contact us anyway. From time to time, our construction crews and servicemen will have the water off to perform various functions in the day to day operations of the water system. If this was a planned outage, an employee should have attempted to contact you at your house and notify you of what they are doing and how long the water will be off. In the event they were not able to talk to you, they should have left a notice at the front door. Occasionally, buried pipelines will break causing mass outages. Be assured that our crews will mobilize and get to the location of the break as soon as possible to get your water back on. A state statute that requires us to get locations of other buried utilities before digging can slow the process down. You may see an employee at the site of the break and it may appear he is not doing anything but in all likelihood he is waiting for locators from the other utilities such as gas, phone and power to show up. A line break never seems to happen at a time when no one needs water. 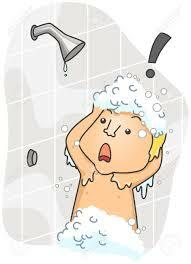 If you are experiencing an outage with shampoo in your hair that can’t be rinsed out, please be patient. A water utility such as Tri-County works to restore water service at no cost to you anytime of the day of night, 7 days a week. Try and get that kind of service from a plumber or heating and cooling service company!